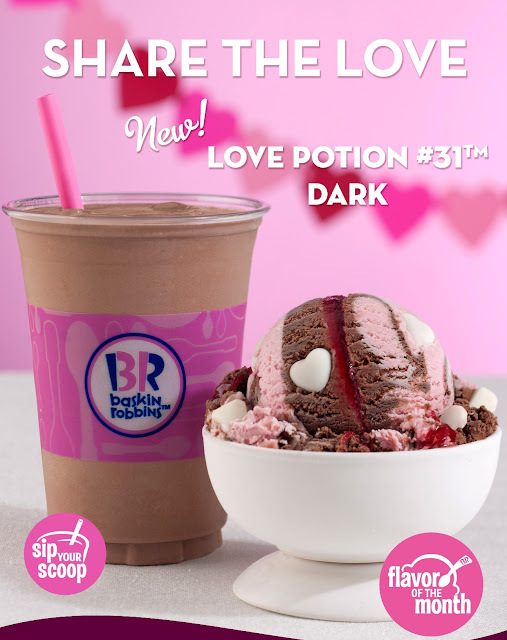 Be spellbound with Baskin-Robbins’ Love Potion #31™ Dark What better way to celebrate the month of love than by indulging in a sweet, mesmerizing treat from Baskin-Robbins, the world’s largest chain of ice cream specialty shops. Be spellbound with the new Love Potion #31™ Dark, Baskin-Robbins’ February flavor of the month – a delightful concoction of chocolate and raspberry flavored ice creams, swirled with white chocolate flavored bits, raspberry-filled hearts and a red raspberry ribbon. Love Potion #31 Dark goes well with Baskin-Robbins’ classic Love Potion #31 ice cream – a well loved medley of white chocolate and raspberry ice creams with a raspberry ribbon, chocolate chips and raspberry-filled chocolate flavored hearts. The two make a perfect match of rich and creamy flavors all swirled into a single scoop and can be enjoyed together in a two-Scoop ice cream sundae which is perfect on its own or shared with that special someone.